In 2013, Kotonoha no Niwa won the Kobe Theatrical Film Award, shared the Satoshi Kon Award for Achievement in Animation with Berserk: Ougon Jidaihen III - Kourin. In 2014, the movie won the AniMovie Award for best feature film. Makoto Shinkai is a name that has become increasingly prevalent over the years. And for good reason, too. After hitting the anime industry in 2007 with his opus magnum "5 Centimeters Per Second", he quickly established himself as a director with the ability to combine masterful artistic talent with emotional, bittersweet storytelling. Does his latest animation achieve that same ideal? In some ways, it does. But if you are awaiting another great story, this is not what you are looking for. "The Garden of Words" is a short film depicting the romance and relationship between a 15-year-old boy and 27-year-old woman. Takao, the boy, feels lost and alienated by his uncertain future and passion for shoemaking. Concurrently, Yukino feels lost in an adult society where she feels she does not belong. It's a premise that holds potential for a compelling story. How many films deal with such an age gap, especially with an older female? Very few. Sadly, this film doesn't realize its inherent potential. Rarely are their feelings for each other actually explored. It simply is. They meet, they talk, they fall in love. And why? The relationship seems platonic until a sudden confession at the very end. While the romance is at least passable, one can't shake off the feeling that more could have been done with the two. It all just feels a bit contrived. Then again, one could always ask: with only 46 minutes of film, isn't it too much to expect developed characters and relationships? Maybe. But Shinkai was not constrained. He could have simply increased the length and have made the story exponentially better as a result. Where "The Garden of Words" makes up for its romance, perhaps, is in its dialogue. What makes the dialogue so intriguing is not what it does, but what it doesn't do. It is simple, restrained; often limited to ordinary conversations between the characters. It shows more than tells. When Takao's dreams of being a shoemaker are revealed, it is through watching him sketch feet outside and craft shoes in his room. When it must tell, it relies on introspective monologues and poetic conversation. It gives us the time to think and the time for the atmosphere to establish itself. The modesty of the dialogue captures the monotony of their lives-- the change that they experience together. Or at least that is what the majority of the film accomplishes. What builds as a subtle, heartwarming story regrettably ends as conventional melodrama. Any maturity in the characters is thrown aside in favor of screaming and crying. And, yet again, it relies on Shinkai's exhausted theme of unrequited love. For once, just once-- could he bother to convey the romance differently? It would be a sad thing if a director with so much talent was reduced to being a one-trick-pony. He is capable of more than this. I would like to believe that, anyway. From a visual perspective, Shinkai's latest is nothing short of a masterpiece. If you have watched any of his previous works (notably 5 Centimeters Per Second), you will be very much familiar with the gorgeous scenery and eyecandy that accompany them. And is eyecandy ever plentiful here. It is a visual spectacle in every regard, meant to have us immersed in the world. Perhaps too much so, as you might find yourself so stunned by the scenery that any dialogue will sound like little more than background noise. Numerous animation techniques are employed in the film. The most prominent of which is a depth of field effect, often used but never to the point of being distracting. Lens flare and careful panning are also frequently used to accentuate the scenery. Not a single error (at least noticeably) exists within the animation or artwork, thanks to Shinkai's meticulous attention to detail. There are times when the artwork looks and feels so authentic that it could very well be mistaken for live-action at a glance. "The Garden of Words" may be the best-looking anime to date. It is something that other animated films will (and should) aspire to, and nothing more could be asked from it visually. Rain is the primary theme of "The Garden of Words", both in narrative and aesthetics. In storytelling, rain is often used to represent loneliness. Here instead the rain symbolizes happiness and peace. It succeeds in creating the appropriate atmosphere for the film, ensuring that there is more here to experience than the visuals. It is just as much an experience to feel as it is to gawk at. The score comprises mostly of piano pieces and ambient noise which serve to further immerse the viewer. It's deliberately simple-- anything thrilling would only serve to undermine the experience. Notably, there is one vocal piece that plays during the climax and credits. I didn't think too much of it other than "Hey, this reminds me of 5cm/s!" So what is "The Garden of Words" in the end, beyond a visual and aural treat? I would tell you that it is not a very good story. What brilliance it holds at the start is obstructed by lackluster characterization and cloying drama. With more focus given to the writing process and with a story at least partly equal to its production quality, this may have been a film to remember for years to come. As it stands, it is a captivating but ultimately disappointing experience. It could have been much more without the melodrama and with more room given for the characters to live and breathe. After all, beauty is best achieved in simplicity. If only Shinkai held to this for the entire film. The greatest injustice that can be inflicted upon “Kotonoha no Niwa” is to falsely and narrowly label this 46-minute film a simple story of love. Too often do you see people claim that this movie is one about a "forbidden love" created by an age difference and it is through these lens that unwarranted and confused criticisms of the show sometimes emerge. The Garden of Words has a level of nuanced complexity that is concealed for the presumptuous as it requires you to think and pay attention to its use of visuals as well as its dialogue to realise this. Indeed, Makoto Shinkai himself stated that he wanted to write a tale of “lonely sadness” and whilst romance is definitely a prevalent theme, it is not portrayed nor explored in a traditional fashion. The entire plot centralises around the interactions between our two main characters: a young student and a mysterious grown-up woman. Be that as it may, the dialogue is very minimal but simultaneously so potent for a vast majority of the development that occurs and the insights we gain into our protagonists hinges upon brief and restrained conversations. It is the absence of dialogue in many cases that convey human emotions more eminently and passionately than when spoken and the visuals play an incredible role to enhance this. Given the film’s brevity, it requires every element to contribute to the plot and no element exists without a reason – be it simple movements, scenery, music or dialogue. It is truly impressive to see how effectively and concisely deep emotions and their underlying intentions are conveyed. The story is told elegantly for nothing is wasted. Rain is a fundamental aspect that initially represents the condition necessary for our protagonists to meet. I think with regards to the symbolism that Shinkai has employed to explore key themes, it is better if you watch and contemplate yourself on them as this is where the majority of the satisfaction lies in this movie. The most impressive aspect of the Shinkai's film was how effectively extended metaphors such as the rain were used consistently and in an enlightening fashion which keeps the film short yet brimming with sentiment. These themes coalesce with our characters and their self-discoveries to tell a larger story at hand in a modern social context exploring the Japanese traditional notion of love. Takao’s burning desire to transcend into adulthood and realise his dreams is beautifully embodied by the older and seemingly sophisticated woman but even during the film’s brief journey, Takao’s preconceptions are deconstructed and despite their differences, they come to realise their similarities through their interactions under the rain which are painfully human. Perhaps my only significant issue I found was the lack of emotional intensity or potency that led our female main character to the position and predicament she was in. By no means was it weak but it seemed lacking compared to how brilliantly Takao was characterised and this slight imbalance for me, hampered the final climax to a certain degree. For a film whose strengths lies in its representation through resigned soliloquies, much of the portrayal lies in the hands of the artwork and animation which are nothing short of a masterpiece. This is the most visually impressive work I have ever seen in the entirety of the anime medium. The animation is flawless with excellent cinematography such as clever use of deep focus in more intimate scenes that successfully emphasise key metaphors employed and well angled panoramas boasting the vast and gorgeous landscapes that are a sight for sore eyes. The sceneries and landscapes are meticulously drawn with details that are exceptionally similar to real life further enhancing the immersion of the experience. The musical score has a larger focus on softer pieces that almost act as an addition to natural sounds of rain and nature or the cacophony of city-life. The soundtrack is entirely piano-based and range from subtler pieces that capture the ambience of the moment to more prominent pieces such as “Greenery Rain” (one of my favourite anime OSTs) which accompany many of the visual experiences. “Kotonoha no Niwa” is a magnificent movie that adopts a more nuanced and authentic approach in exploring human relationships. As stated initially, this is not simply a bittersweet romance that many condemn it to be but a subtle journey into the solitude and desires humans hold, within a prominent and relevant modern day social context. All of this is delivered to viewers in a film that entirely takes advantage of the anime medium, showing just how much artistry and cinematic storytelling that resonates within you (as most Shinkai films do) can be achieved in a what is fundamentally 46 minutes of animated images. “Oh lord my eyes!” Well, that's the first four words that I thought when I watched this 46 minute film. I mean it in a good way though because this movie is something of a beauty. A few words to describe them from my mind are: alluring, charming, bewitching, glorious, and elegant. But beyond just the visuals lies a story about a young man (shoemaker to be exact) and a woman named Yukino. Together, they formulate this movie that is expressed in the Garden of Words. 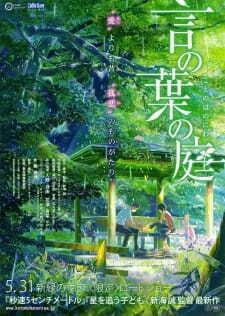 Garden of Words (also known as Kotonoha no Niwa) is a 2013 film and the latest installation of Makoto Shinkai's works. He is already known as a famous Japanese director as well as a former graphic designer. He is previously known for his involvement in other films such as The Place Promised in Our Early Days, 5 Centimeters Per Second, and Children Who Chase Lost Voices. As both director and writer of this latest movie, he puts his skills to test once again and I am grateful to say that it was definitely a memorable experience. The story is told in a narrative perspective by a young man named Takao Akizuki during the mid year of June. He is 15 years old and has hopes to become a shoemaker. On a rainy day in June, he meets a mysterious woman named Yukari Yukino. They seem to be striking up a conversation that begins with an unfamiliar mood. The rain dark clouds covers the skies with claps of thunder strikes their first unusual encounter in the garden. For the setting of the movie, it takes place in modern Tokyo seemingly in a normal environment. There's nothing too unusual going around the place with the sunny mornings, the cloudy sky, and passing days of riding the subway station. However, what becomes unusual is Takao and his admiration of shoes as well as Yukari's feet. His artwork expresses his desire to become a shoemaker more than ever. As mentioned in the film, it is in Takao's mind on what will get him out of his current living standards. Throughout the film, it's observed that Takao and Yukino's bonds become stronger through their first unusual meeting in the garden to food sharing and later on with more of emotional attachment. Despite this, their relationship is lighthearted but again unusual. Takao dreams to become a shoemaker and here we have Yukino and her feet. The two doesn't know anything about each other but their connection somehow bonds them together. Takao is charmed by her presence and with the pouring rain symbolizes a picture worth a thousand words. The season continues on. Seemingly every day, the atmosphere of this movie gives off a natural feeling. It's enchanting to see how everything flow along with the pouring rain. The fact days passes by like pouring rain but later on, it shows more of a clear sky. Throughout this time, it's clear that Takao has a clear mind with what he wants to do. He wants to become a shoemaker and with a proper mind set tries to raise income to achieve the task. After all, money don't grow on trees and everything has a price. Takao and Yukino's relationship throughout the movie seems to be based on a strange connection. It's hard to make out exactly what it is because of their unusual encounter in the garden in the first place. But still, there's definitely a connection between them. It's just that the connection here seems to be rather blend due to Takao's lack of knowledge regarding Yukino. However, it's clear that he cares for her. In fact, his rage builds up whenever Yukino's name is heard from Takao's ears when something negatively is spoken behind her back. Most of the time though, Takao seems to be in his own little world. The series also adopts the 'romance' genre so naturally, their budding relationship steers from strangers, to platonic, and romantic. To be honest, I find this rather bit bizarre and out of place. They've only met for less than a few months with little knowledge of each other. Furthermore, their relationship seems to be more of a fantasy from my perspective rather than realistic. It's definitely something not many of us see in every day life where people gets connected by shoes and feet, right? Like most of Mikoto Shinkai's films, the movie moves with feelings from a calm mood to more of a dramatic. This is expressed through secrets that are revealed later on. Under the rainy clouds, their tears pour and expresses emotions from the bottom of their hearts. Did I find this appealing? Yes. Did I feel the emotions of the characters? No. To me, this was just rushed in terms of relationship. In just that summer, bonds are established but once the dog days are over, it just becomes blend again. That's how I felt for the story anyways. The artwork of this series is spectacular. Have you ever seen a bright rainbow right after a long shower? Perhaps this is how I viewed the visuals throughout this film. It is majestic and has a strong radiance that shines more than the cloudy skies that fills the settings. As expected of Makoto Shinaki, a former graphic designer, he puts his skills at work and obviously makes it dazzling for viewers to enjoy those scenery. It is no doubt in my mind the visuals of this series deserves a standing ovation. On another note, the soundtrack of this movie combines a piano like tone with a song of melody to top things off. The ED song, "Rain" by Motohiro Hata shows emotions flowing through the backgrounds of our two main characters. Needless to say, it puts you in the shoes of their emotions. Along the way, the calm and lighthearted OST gives off a balanced vibe of naturalism. The dialogues spoken by the characters shows their everyday life tones while rage and emotions are expressed in a more intimating voice. I give praise to Kana Hanazawa who is known for her many works and in this movie, she shows the world her talent once again with her dazzling expressions and mannerisms. For fans of Makoto Shinkai, this is definitely a film to watch and enjoy. However, if you're looking for more of a deeper plot, then that might leave you a bit more unsatisfied. At the same time, some hopes just doesn't keep up with my own expectations especially in the story department. Needless to say though, the colorful and artistic visuals of Garden of Words will paint you a memory you won't forget. Along with the soundtrack and song, it captures a moment where you feel as if you were there with the characters. It's also from this moment that hopes are formed with Takao and Yukino. There's this feeling from this 46 minute film I got that people can relate to. It's about hopes and dreams for the future. Takao wants to be a shoemaker and that's what he aims to be. I'm sure most of us has our own hopes and dreams for the future as well. Well with that said being and done, I HOPE you enjoy this film. If there’s one, obvious theme that connects all of Makoto Shinkai’s works, it would be “distance”. As a bittersweet love story, The Garden of Words carries similar expectations to Shinkai’s other popularized works, Five cm per Second, The Place Promised in Our Early Days, and Voices of a Distant Star. Shinkai uses beyond-gorgeous animation to tell a modest yet believable story, and The Garden of Words is as bare-boned as a love story comes. The movie takes place over a summer, where a 15 year-old aspiring shoemaker meets an eccentric and mysterious 27-year old woman. Their backstories are hardly touched on, but the boy is seen as wise beyond his years, independent and seemingly forced to grow up prematurely. On the other hand, the woman is more aloof, and clumsy in behavior. She feels as if she’s unable to move past her youth, but reveals little else otherwise. As in other Shinkai films, the dialogue exchanged between the two characters is minimalistic, and for the most part, inconsequential. However, the frequency of silence is what best represents Shinkai’s abilities as a storyteller, and therein lies the significance of the movie’s title, “The Garden of Words”. Despite being a character-driven story with first person narration, the movie devotes a great deal of time with scenic shots. Shinkai has drawn a fully realized yet enclosed setting, and the details he’s put into this literal garden are nothing short of gratuitous. Shots of a cicada shedding its shell, raindrops dancing on the surface of a pond, and a tree branch dipping into a lake boasts an almost over-bearing attention to detail, but these gratuities do more than show off Shinkai’s talents in animation. Due to the differences in age and personality between the characters, the garden is supposed to express what the characters themselves cannot – a “Garden of Words”. The two characters are all-too-happy to see rain (which is usually a heavy-handed symbol for sadness or isolation), because of the shelter that the garden provides and its ability to emotionally connect the two beyond words. … Which leads us to one of the film’s biggest issues: a 46 minute runtime. While it wastes little of its prohibitive length with contemplative monologues of the characters’ ambitions and awe-inspiring displays of setting, a romance that’s fostered over silent meetings can feel superficial. Furthermore, the film’s climax is a sort of departure from Shinkai’s usual endings. Breaking the subtlety and slow pace at which the characters’ relationship develops, the film’s climax shows an uncharacteristically forceful and crude confrontation. As an outburst of emotion with a fair bit of yelling and crying, it’s less powerful than the silent, emotional climaxes of previous Shinkai films, but not awkward enough to be dismissed as melodrama. The film even ends with the same unrequited love as most of his previous works, but the lack of fulfillment didn’t share the same effectiveness as it did in 5 cm per second, being a lot less ambiguous yet ending with the same, physical distance between the two characters. In the sound department, The Garden of Words consists mostly of ambience, with the exception of a handful of beautifully composed piano solos. Both were done with great effectiveness, with the sound of rain meticulously matching each droplet appearing in animation. The Garden of Words is probably the most visually appealing anime I’ve watched, but story-wise, it may not be as memorable, nor can it avoid comparisons with Shinkai’s other works. That said, its subtleties in storytelling and flawless visuals makes it absolutely remarkable, and a veritable visual feast for fans of the romance genre. Does anyone know which year it is in the film?